If you're a fan of films like the Mad Max series, or you love RPGs like Dystopia Rising, you probably have a thing for post-apocalyptic weaponry. Whether it's scrap metal scimitars, or the WWII-era workhorses that still fire straight and true after generations of desert grit, there's something compelling about wasteland warfare. The refusal of the human race to die, and an ability to fight (or even flourish) in the most wretched conditions is inspiring... in an awful sort of way. All of that is wrapped up in a simple, complete package over at Miller Knives. This beast started life as a HORSESHOE! That beauty, as well as the other blades on the channel, are made by Stephen Miller. According to the smith himself, he's been making blades for some time now, but it's only been within the past year or so that he's put his work up on YouTube. A huge fan of both Mad Max and The Walking Dead, some of Miller's earlier experiments involved taking rasps and files, and turning them into weapons. Nowadays... well, see for yourself! That, right there, is the sort of weapon a goblin would kill for. 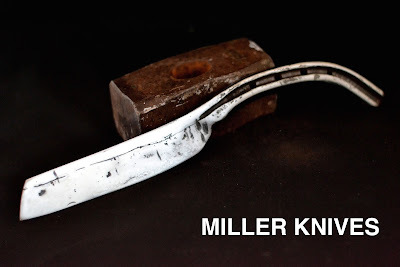 And it's just one of a dozen different projects Miller Knives has up right now. Everything from a Viking greatax to a tomahawk made from an old railroad spike. It's some seriously great stuff. Additionally, if his audience keeps growing the way it is, chances are good you'll be able to buy some of these weapons for your very own. They're not LARP appropriate, of course, but hey, when the apocalypse comes at least you'll be well-armed. If you are looking for LARP accessories, as well as wearable post-apocalyptic gear, though, you should take a look at Post-Apocalyptic LARP Accessories That Won't Break The Bank? Check out Karol B. He has just what you're looking for, and at a price you can afford. Also, if you're a sucker for forge-related videos, you should check out "Secrets of The Viking Sword" is a Documentary About How to Make a Masterwork Weapon, as well as Making a Miniature Sword From a Nail! That's all for this week's Moon Pope Monday installment. If you enjoyed it, please like and share this story with your friends. If you'd like to support Improved Initiative so I keep creating more content just like this, stop by The Literary Mercenary's Patreon page and make a donation. It doesn't take much; $1 a month gets you my eternal gratitude, as well as some sweet swag. Lastly, if you haven't followed me on Facebook, Tumblr, or Twitter yet... well, why not start now?